Plump Hill was shrouded in low cloud until it cleared in the afternoon. 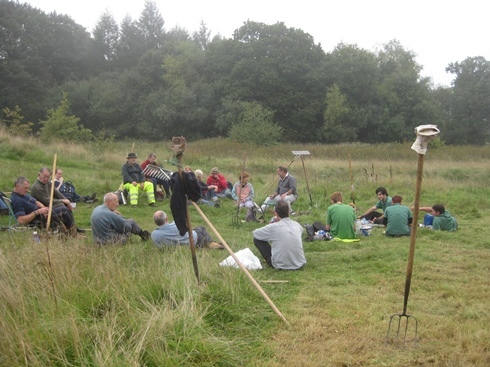 A good number of people turned up to help rake the heath in order to assist the Autumn Gentian to thrive. Four Forestry Commission apprentices were with us and they were using the brush cutters to mow the long grass away whilst we followed them equipped with rakes. This site is on a Limestone bed and is very important for Autumn Gentian and Autumn Lady's Tresses so the job of strimming the turf and raking the grass is very beneficial to these species which was shown this year when a good number of these plants were in bloom after we had done this task earlier in the year. 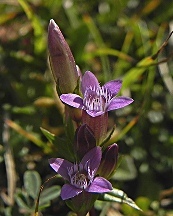 Gentians have medicinal uses, and have historically been used to treat digestive disorders. This biennial herb is generally rare in the Country. If you are lucky enough to find one it is likely to be on limestone soils amongst short open calcareous grassland. It is a late flowering-species; the lilac flowers can be seen from August to October. The team are at rest after a few hours of raking. 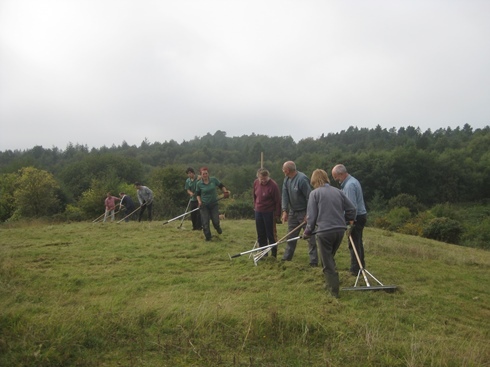 This photo was taken in the afternoon as the team were double raking along the top of the hill and they have just spotted another slow worm amongst the grass. 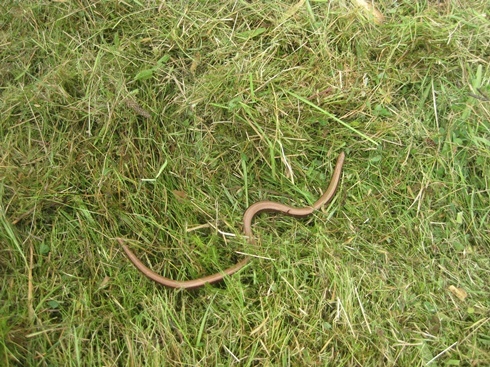 This is the Slow worm we spotted. We had raked the grass into piles along the edge of the area to provide cover for creatures such as these so we moved this worm to one of these piles.